The general consensus is to call the police and file a report following a vehicle accident, however not every incident is considered something that involves such measures. If there were no injuries and damages to the vehicles were extremely minimal, the police do not usually have to be called. People in many incidents of gentle bumps or minor accidents will attempt to work it out together. Although this may seem optimal, it is important to remember that insurance companies expect you to report any and all incidents, even if New Jersey law only specifies that need under certain conditions. New Jersey State Law requires you to report your car accident to the police if the accident causes ANY injury, death, or involves damaged property higher than $500. The law also mentions that you should do so by the “quickest means of communication.” This generally means that you should make a quick phone call or ask someone with a phone to do so. There are risks to not calling the police, even in accidents that you and the other party consider “not serious.” Someone involved in the accident may have an injury, but they may not be showing immediate symptoms due to stress hormones released due to fear caused by the incident. Police and ambulance officials are trained to look for certain issues and to bring you to the hospital when there is any possible risk. There are also circumstances in which the other party does not want to report it because they are uninsured. You will want to get law officials involved if this is the case, because if something goes wrong with your health or your vehicle after you resolve things with the other party, you are even less likely to get a settlement from your own car insurance company. Any automobile insurance provider you have will expect you to file a report with them if you get into an accident. Whether it was severe and resulted in serious injuries or was a little rear-ending bump, you are required to do so. This isn’t a required by law, but can have a coverage consequence if you and the other party decide to remain silent. The only time we would recommend you don’t report it to the insurance company is if you were in a scenario that did not involve another party. 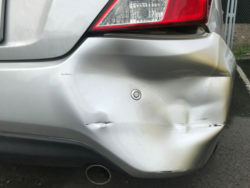 For instance, if you backed into your mailbox or garage door, you can go and get this taken care of at a local auto shop. Did you or a loved one sustain serious injuries due to a vehicle accident in New Jersey? Don’t let the medical bills pile up while you wait for the negligent party or their insurance company to do the right thing. Right now, you need an aggressive personal injury attorney on your side, fighting to get you the compensation you need, want, and deserve. The skilled attorneys at The Law Offices of Richard A. Stoloff represent clients injured because of car accidents in Egg Harbor, Hammonton, Somers Point, Pleasantville, and throughout New Jersey. Call (609) 601-2233 or email us to schedule a free consultation about your case. We have an office conveniently located at 605 New Road, 1st Floor, Linwood, NJ 08221, as well as an office in Philadelphia, PA.